Merry Christmas! 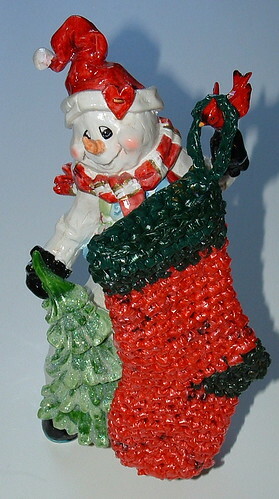 What better way to celebrate the holidays than with recycled crafting. 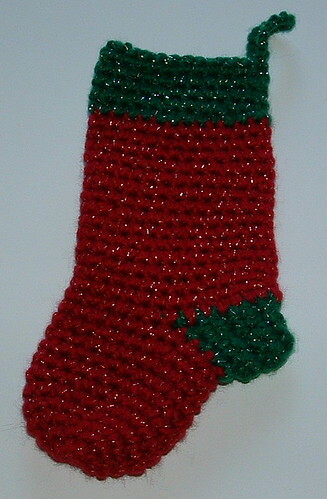 Here is my latest using this ever so cute little Christmas sock pattern. I used a “H” (5 mm) crochet hook and worked the pattern using 8 recycled newspaper plastic bags and one large green retail bag for the trim. The pattern doesn’t state if you should join each round or just work in the round. I single crocheted in the round without joining except for the final round of each color. On the final round of each color, I did join with a slip stitch to keep each color edge smooth. 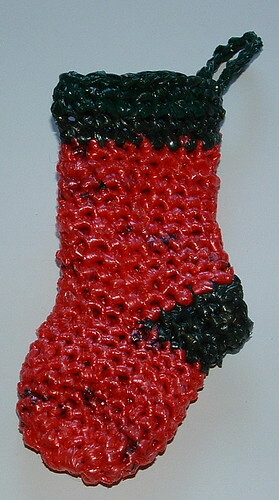 My finished plarn mini stocking is 6 inches long. 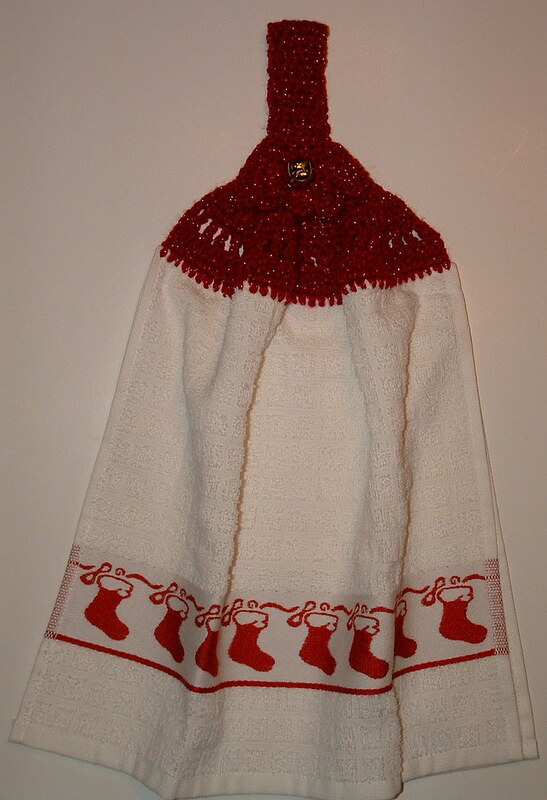 Here is the same pattern crocheted with some ww Christmas yarn. 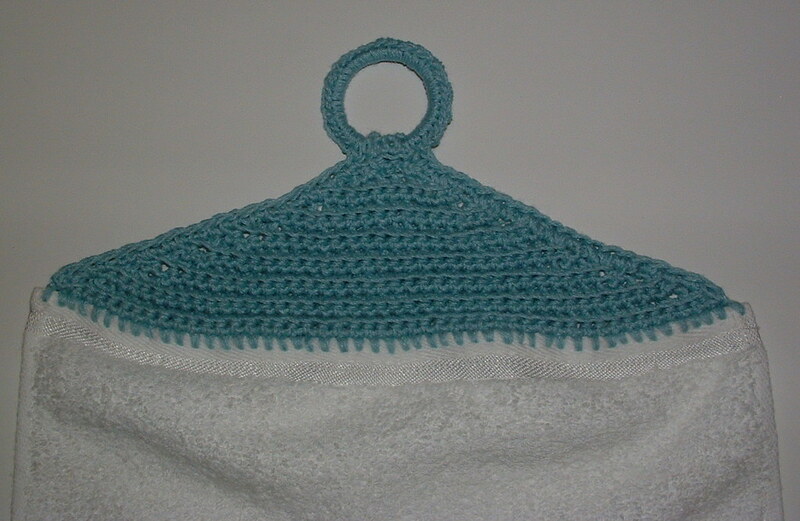 I have been on a crocheted towel topper kick lately. 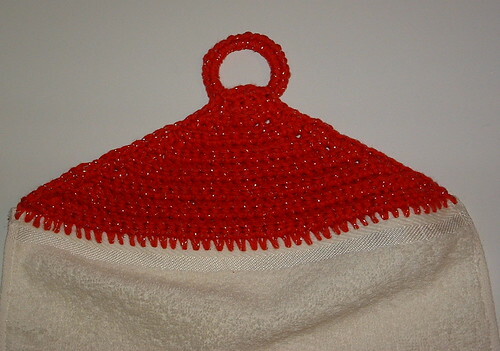 I have crocheted several different ones including ones with rings and those with button closures. 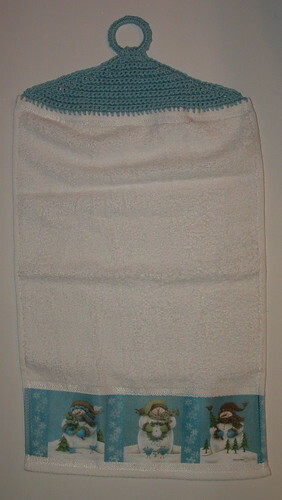 I love doing the no-cutting and no-sewing toppers with double layered towels as they are so nice and thick. Here is the free crochet pattern and picture tutorial for making double layered towel toppers. The method I use is to just fold the towel in half and using a small steel crochet hook, single crochet the base row through both layers along the top of the towel edge. Once this base row is complete, you switch over to a larger hook and the towel topper works up quickly using only about an ounce of yarn. I added a jingle bell for the button closure on this towel. Just chain 2-3 stitches for a larger button opening than the original pattern calls for when you crochet the buttonhole.